*Language: Japanese and spontaneous translation to English. As a child, Tsutomu Uematsu loved paper airplanes and yearned for outer space. At university, he studied fluid mechanics before joining a company in Nagoya, where he worked on aircraft design. In 1994, he returned to his native Hokkaido to join Uematsu Electric, the company operated by his father Kiyoshi. There, he developed and manufactured an electromagnet for removing and isolating iron from industrial waste. 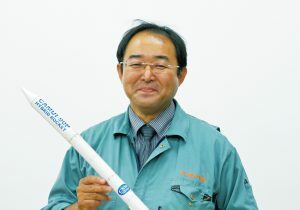 About 10 years later, after encountering the Hokkaido University Graduate School of Engineering was researching the CAMUI rocket, he decided to fully support the rocket research with his yearning for outer space once again. Mr. Uematsu’s most notable achievements have been the development and launch of the HIT-SAT artificial satellite, test launches of the CAMUI rocket. At corporate seminars and lectures throughout Japan (also at schools), Mr. Uematsu communicates the importance of expanding the possibilities of human activity. He also dedicates himself to helping younger generations to dream, for example by organizing “space camps” to enable children to learn about space in an enjoyable way, and providing opportunities for practical, hands-on experiential learning to elementary, middle-school, and high-school students. Representative Director, Uematsu Electric Co., Ltd.
Representative Director, Camui Space Works Co., Ltd. Copyright © Japan International Weldingshow 2020 All rights reserved.